Simon Hantaï is a Hungarian painter born on December, 7th 1922, generally associated with abstract art. He took the French Nationality in 1966. After studying at the Budapest School of Fine Art, he travelled through Italy on foot and moved to France in 1948. He was friend with André Breton, who even wrote the preface to his first exhibition catalogue in Paris. Later in 1955 Hantaï broke with the surrealist group. 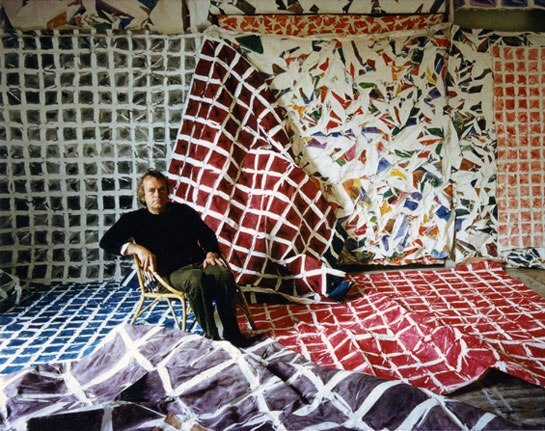 In 1960, Hantaï developed his technique of "pliage" (folding): the canvas is folded and scrunched, then doused with colour, and unfolded, leaving apparent blank sections of the canvas interrupted by vibrant splashes of colour. Hantai first started working on his folding method from 1960 to 1962 with the cloaks, a reference to the idiom of landscape. From 1967 to 1968 he worked on the Meuns series where he studies the theme of the figure. 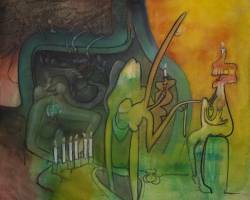 Meun is the name of a small village in the Fontainbleau Forest where the artist lived starting 1965. A retrospective of his work was held at the Centre Pompidou in 1976, and in 1982 he represented France at the Venice Biennale. A Simon Hantaï Restrospective opened at the Centre Pompidou on May 22, 2013 with more than 130 works from 1949 to 1990s, and a full color illustrated catalog.